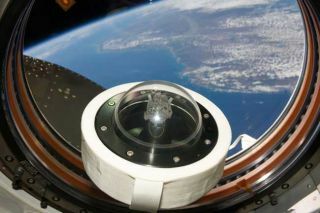 A moon rock brought to Earth by Apollo 11, humans' first landing on the moon in July 1969, is shown as it floats aboard the International Space Station. Part of Earth can be seen through the window. The 3.6 billion year-old lunar sample was flown to the station in honor of the July 2009 40th anniversary of the historic first moon landing. It was returned on shuttle mission STS-128 to be publicly displayed. Genuinemoon water has been found for the first time in rocks that were brought back toEarth during NASA?s historic Apollo missions 40 years ago. The water issimilar to that detected in comets, suggesting that the moon?s scarce supply gotthere through the impacts of these icy bodies.?? Todetermine where this moonwater came from, researchers studied thin slices of rocks collected byastronauts in the 1970s using several kinds of microscopes. Under examinationwas the ratio of hydrogen ? two atoms of which bind with oxygen to make a watermolecule ? to a rare version of hydrogen called deuterium. ? JamesGreenwood, a planetary scientist at Wesleyan University and lead author of anew paper describing the results, said he and his colleagues discovered thatthe levels of the deuterium isotope in moon water are double that of Earth?sand ?not from this planet.? ?Thisis cometarywater and not the same-old water we have on Earth,? said study co-authorLawrence Taylor, a planetary geochemist at the University of Tennessee. TheApollo moon rock water is the latest in a recent string of discoveries of waterand ice on the lunar surface. Lastweek, scientists announced that more than 600 million tons of moonwater ice is lurking at the bottom of dark craters at the lunar north pole.Water vapor was also spotted during the intentional crash of two NASA probesinto similarly shadowed craters at the moon?s south pole in October. Observationsfrom several NASA and international probes have also found the chemicalsignature for water across other regions of the moon. But the first detectionof lunar water, though in soil rather than inside a rock, came two years ago involcanicglass beads. Exposureof those samples to the solar wind, or particles from the sun, on the moon?ssurface renders their deuterium-hydrogen ratio difficult to determine, Greenwoodsaid, making a stab at the origin of their water guesswork. Tracesof water had turned up in Apollo rocks previously, but Taylor and others hadshown this water to be a result of contamination from terrestrial water. Impactsfrom comets likely dumped unearthly water on the moon some four billion yearsago when many of the moon?scraters were gouged out. Earth also took a beating, and a small amount ofour planet?s water came from the skies as well. Analternative scenario for the new hydrogen readings is that some regular hydrogenblew off the moon as it formed, depleting amounts of it compared to deuterium,Greenwood noted, but that it is too soon to tell. Thenew finding of bona-fide lunar water in this first set of Apollo rocks willhelp update historical water estimates for the moon, according to the study. ? Andcontinued work could have big implications for lunar geology which may explainpuzzling density differences of lunar minerals compared to those on earth. ?Just a little water,? Taylor said, can dramatically change how rocks form andage. ?This is a precursory examination that has shown startling things,? Tayloradded. Thisannouncement of water in lunar rocks follows on the heels of its recent detectionby orbiting probes including India?s Chandrayaan-1 and by NASA?s LCROSS missionlast fall. ?Ithink we are embarking into a new era of looking at a wet moon,? Greenwood toldSPACE.com. ?Everything will have to be rethought.? Theresearch was presented at the 41st Lunar and Planetary Science Conference inTexas last week.